The coffee morning at Chebsey, Staffordshire yesterday was a great success, not only for me as I sold several books, but also for the other stall holders. For such a small village event there was an amazing turn-out and we were steadily busy all morning. I’m sure a very satisfying sum was raised for this good cause. Unfortunately I forgot to take either my camera or my mobile phone so, alas, no pictures! Elizabeth will be selling her books at a fund raising coffee morning in aid of the Donna Louise Trust to be held in the village hall in Chebsey, Staffordshire from 10.00 am until 1.00 pm tomorrow, 28th March 2015. There will be plenty of other stalls to visit too so if you are in the area and able to come along we would be pleased to meet you. 2013 has been a fairly quiet year for Silverburn Publishing with no new books to date. We have only been in attendance at three events this year. The first, on Friday 6th September was a fund raising Fashion Show held by The Friends of the Donna Louise Trust where I was invited to have a stall alongside others selling accessories, jewelery and other items. 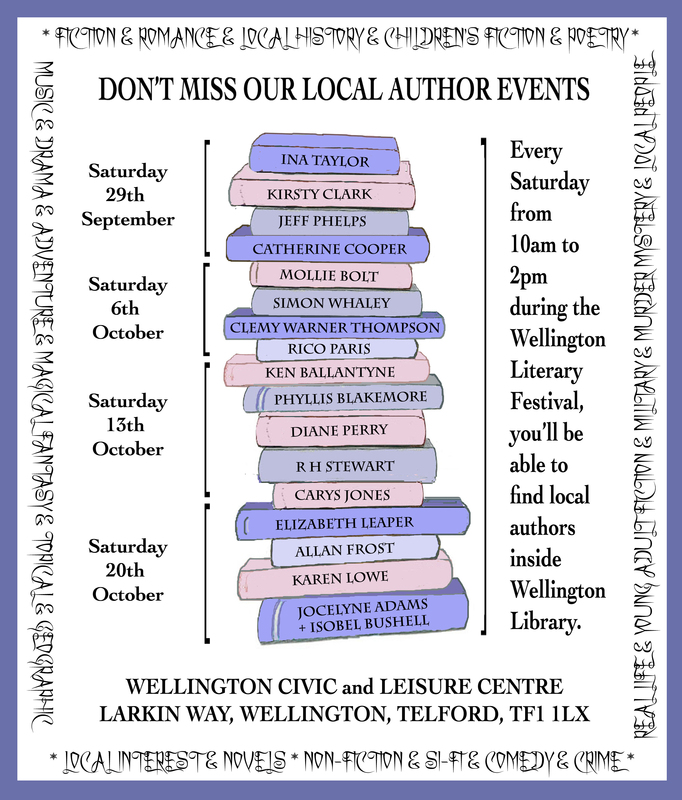 The second event was the Wellington Literary Festival, in Wellington, Shropshire, which we also attended in 2012. This year the 5th October was a dedicated children’s literature day. It was held in the local, very vibrant, Library and it was a pleasure to be there and talk to the children who came by the stall. 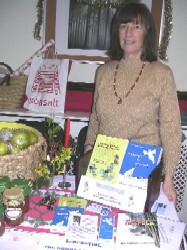 The final event of the year was a stall at the Woodseaves Christmas Fayre held on Sunday 8th December. Woodseaves is a small village near my home and the event was very well supported by locals and people from further afield. I shared a stall with another children’s writer and a mutual friend of ours selling her home produce. As you can see from the attached photograph of my little corner we were rather cramped. However the stall holder next to us didn’t turn up so we were able to spread out more after this photo was taken. 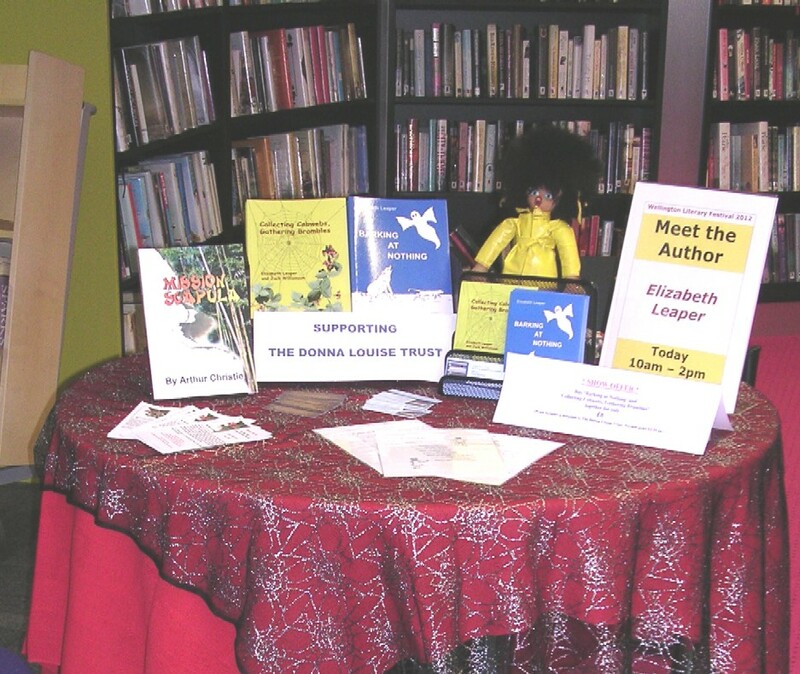 All three events were very rewarding experiences and produced a number of sales of both my books, all helping to raise money for, and awareness of, The Donna Louise Trust. To find out more about the Donna Louise Trust just click on the link in the General Interest catrgory in the sidebar. 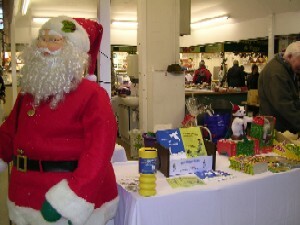 This is my little corner of the ‘Friends of the Donna Louise Trust’ stall at Stafford Market on Saturday 8th December 2012, where I was selling copies of both ‘Barking at Nothing’ and ‘Collecting Cobwebs, Gathering Brambles.’ I was in good company as you can see, though he rather rudely kept his back to me. The day was quite successful despite a fairly low footfall. We were apparently competing with a Christmas Market in the town square! I shall be there again next Saturday (15th Dec.) when there should be more people about as the neighbouring stall will be doing Face Painting amongst other things and there will be free mince pies. If you are in the area why not come along? To find out more about the Donna Louise Trust click on the link in the sidebar. 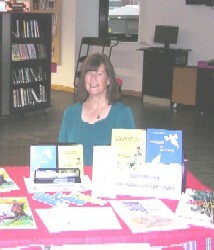 On Saturday 20th October I attended the Local Authors event held in Wellington Library as part of the Wellington (Shropshire) Literary Festival. 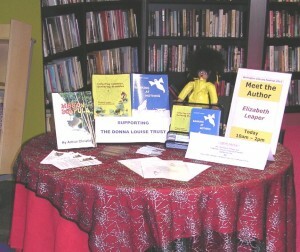 The festival was spread over three weeks with different authors in the library on each Saturday. A wonderful venue with many appreciative people visiting the table. The Literary Festival is an annual event but this is the first time I have attended. I certainly hope to add it to my calendar for the future. Many thanks to the organisers of this successful event. 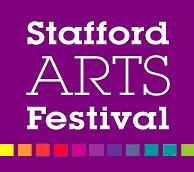 See also our EVENTS page HERE and athe dedicated webpage HERE for further information. 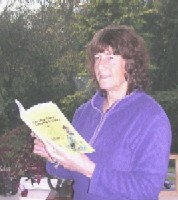 Carys Jones: author of; Not All Stars Sparkle, a Crime Thriller aimed at adults. Lia Ginno: is a children’s author and has had five books published. The Legend series – The Legends and the Inca Crystals, The Legends Saving the Rainforest, The Legends and the Bible Code Quest all follow the magical adventures of two children with special powers for 10- 14 age. The Gallant Three is a mystery and the first story in a special pals series for 7 -10 years. Nanny’s Babysitting Adventures combine four stories with jokes and activities for ages from 4 – 9 years. Clemy Warner-Thompson: has written Purest Light and Darkest Regrets (the first two of three). They are both fantasy and aimed towards teenagers who are in secondary school. Elizabeth Leaper: is a Poet, Writer and Illustrator who has published works including Barking at Nothing and Collecting Cobwebs, Gathering Brambles. RH Stewart writes gripping tales for teenagers Devils Creature in the City of the Dead and God of the Underworld are guaranteed to stir the imagination. Janet Thompson: writes charming children’s books: Duel in the Attic, The adventures of Tiger, Duel Under the Sea and Pretty Stupid Stories. Suzie Litton-Wood’s book is set in the time of the First World War; Our Josh tells the story of a typical narrow boat family and is brought to life using the rich local dialect of the East Midlands. Marilyn L Rice: is a writer of contemporary fiction, her 5 published books include; Time & Tide’, ‘No Regrets’, ‘Stay in Touch’. Michael J Smedley: hails from Derbyshire and has written several published novels including; Late Cut, A Subtle Revenge, and Manna from Abaddon which are set in the Peak District. Nick Thom: writes non-fiction books about very ancient history The Origin of Tongues, History Re-written and The Great Flood are aimed at adults and older teenagers. Phillip Baker’s novel Needle on Red – is a partly autobiographical diving adventure written with adults in mind but also suitable for teenagers. Catherine Cooper is the author of the Jack Brennin series of magical, fantasy adventure books which include The Golden Acorn and Silver Hill and the Hawke & Co series of real life adventures, humour and fun: The New Neighbours and The Pirate Ship. Rosey Thomas Palmer has written a number of books, her novel Hues of Blackness is set in Jamaica where she lived for many years. Valerie Astill is a travel writer who has published 3 books; From Coconuts to Condors, Temples and Tacos and Rats, Rice and Rickshaws are based on the true life accounts of her and her husband David’s extensive travels. Richard Denning is a practising GP who also writes sci-fi, historical fiction/fantasy books as well as designing board games. His published works include Tomorrows Guardian, The Last Seal and Shield Maiden and are aimed at a teenage audience. Alan Dance was born in Nottinghamshire and has written both fiction and non-fiction books based on the local area. Narrow Marsh and Leen Times are both historical novels set in the 18th century and The Chilwell Ghost is a non-fiction publication using historical records and original source material to explore the truth about a local legend. On Friday 4th November Elizabeth Leaper visited Church Eaton Primary School, Staffordshire, where she read from her books “Barking At Nothing” and “Collecting Cobwebs, Gathering Brambles” to the children of classes 3 and 4. She also talked about the ideas and events that inspire her poems. The children then spent some time writing poems for themselves about Halloween, Bonfire Night or other subjects of their own choice. A selection of the children’s work will be posted on a separate page on this website once they have finished working on them.